IPX4 Sweat and Water Resistant, Lightweight yet strong, PureBoom Wireless Sport Earbuds doesn’t afraid to get a little wet. Bluetooth 4.0 Wireless Technology, Connect seamlessly with all Bluetooth Enabled Devices up to 32 feet away, Pairs with 2 devices at once. 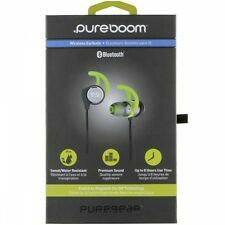 PureGear, PureBoom Premium Sound Buds, 02-001-01601, 0200101601, Black, $30.99, Open box, Universal built-in high grade mic for hands free calls, Answer / end / pause button, Noise isolating ear buds for the purest listening experience, SK-005W5Q-001. A new way to experience sound. The PureBoom Bluetooth Wireless Earbuds provide premium sound using the latest audio technology. Bluetooth range is up to 32 feet. Includes: Bluetooth earbuds, carrying case, charging cable, and extra earbud cushions. Model: Wireless In-Ear Earbuds w/ Mic. Color: Black, Green. Range: 32 feet. Shockproof Slim Case for LG Devices SEE. Slim Silicone Case for HTC Desire SEE. Google 2 XL/2/XL/Pixel 5.0 Holster Combo Case SEE. Trending at C $26.72eBay determines this price through a machine-learned model of the product's sale prices within the last 90 days. PureGear PureBoom in-Ear Bluetooth Premium Sound Headphones Wireless Sport Earbuds w/Mic, IPX4 Sweat and Water Resistant, Universal Fit, 8 Hours Battery, Magnetic Auto On-Off Technology. IPX4 Sweat and Water Resistant, Lightweight yet strong, PureBoom Wireless Sport Earbuds doesnt afraid to get a little wet. PureGear, PureBoom Premium Sound Buds, 02-001-01601, 0200101601, Black, £24.01, Open box, Universal built-in high grade mic for hands free calls, Answer / end / pause button, Noise isolating ear buds for the purest listening experience. PureGear, PureBoom Premium Sound Buds, 02-001-01601, 0200101601, Black, $43.44, Open box, Universal built-in high grade mic for hands free calls, Answer / end / pause button, Noise isolating ear buds for the purest listening experience, SK-005W5Q-001. Stereo earbud for superior sound. Check-Out Now! Features: Purpose: Input Use: This cord allows you to extend the length of cord for you to string the LAL or Estrella light. If we have made a mistake we will always rectify it. Australia, Belgium, Brazil, Canada, Croatia, Denmark, Estonia, Finland, France, Germany, Gibraltar, Great Britain, Hong Kong, Hungary, Ireland, Israel, Italy, Japan, Latvia, Lithuania, Luxembourg, Malaysia, Malta, Netherlands, New Zealand, Portugal, Singapore, South Korea, Spain, Sweden, Switzerland.